What do you do when you’re one of Bali’s top restaurants and people are doing anything they can to get a table? Open up a sister branch serving deli-style fare just up the road to serve the hungry masses, that’s what! 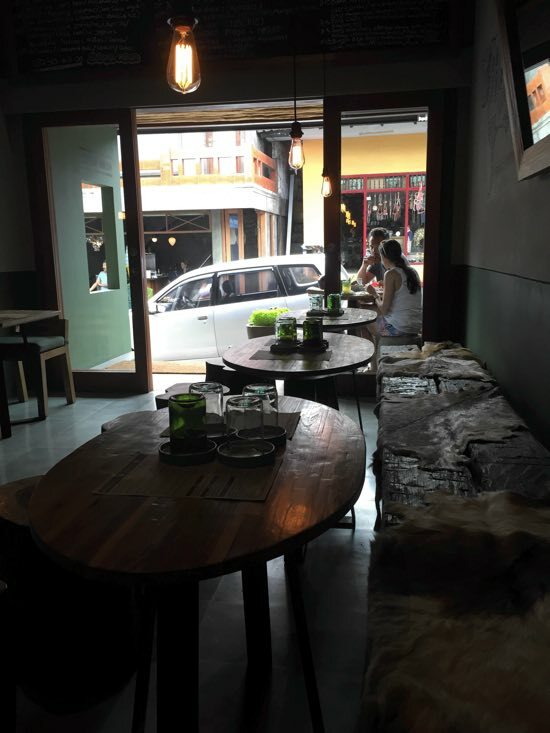 Ubud’s deservedly popular Locavore restaurant has a second iteration just up the hill, where you can grab a divine breakfast, cheeky lunch or now, as of November 2015, they’ve opened for dinner too — that’s how popular they’ve become. It’s a chilled-out, khaki-and-cow-hide affair, where the changing menu by chef team Eelke and Ray is hearty, healthy and made from, as it says right on the can, local ingredients. The breakfast menu is short but sufficient: think waffles, bacon and egg sandwich, granola or eggs Benedict (49,000-73,000 rupiah). We went for lunch most recently. 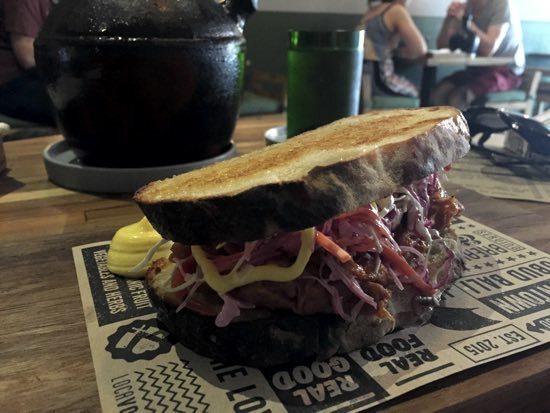 They had run out of ciabatta, so we had our pulled pork sandwich on their sourdough instead, but that was hardly a loss: inside was fall-apart tender pork shoulder braised in a barbecue sauce with a colourful coleslaw and curry mayonnaise (77,000 rupiah). We’re still dying to try the pork sausage on brioche, their take on banh mi and the wagyu patty burger — all around the 73,000-83,000 rupiah mark. Desserts include creme brulee, chocolate mousse and a sorbet of the day — we’ve not tried these yet but are sorely tempted to return ASAP. Dinner involves a three-course set menu (dishes change daily) and goes for 250,000 rupiah, which is frankly a steal for such finger-lickin’ good quality. A recent menus: tomato consomme, roasted leg of Java lamb with lentils and mango tartlet with pastry cream infused with lime leaves, yoghurt and lemongrass sorbet. God, they are going to need a third branch soon. The menu is unabashedly meat-heavy (ethically produced), but if you let them know in advance they can knock you up a vegetarian option. You’re paying more but what you get is as organic and ethically produced as possible — they use, for instance, the only genuinely organic and free-range chooks on the island, for instance. Come early, and come often — it’s so good you almost won’t mind if you’ve missed out on a table at Locavore.